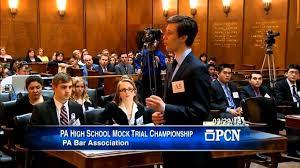 Please consider checking in with your County Bar Association for more details on the Mock Trial Competition in your County. Let's fill those Jury Boxes with attorneys willing to help give these students a great experience. There are no CLE credits available for Mock Trial Competition participation yet, but I am helping a movement to work on that. Here's a LINK to the Tort Talk blog post on the status of that movement. Tuesday, January 29, 2019 at 6:00 p.m.